Wouter was born and raised in Enschede, the only city in the Netherlands where bluegrass still has to be discovered. In his early days he learned to play the classical guitar en after Bach he exchanged the nylon strings by steel strings to be able to play folk music, rock and ragtime. About 1998 he unplugged his Fender Stratocaster and he has been playing strictly accoustic music ever since. Wouter spends his free time building, repairing and modifying musical instruments. Laura was raised in Drachten and moved to Groningen in 1988. She grew up with classical music, playing violin and guitar. She had her first introduction to bluegrass as a fiddleplayer in the fungrassband The Wicked Path of Sin. Nowadays she still plays with members of that band in a band called The Hillbilly Holler. In Stringtime the attention is focused on the traditional way of playing bluegrass. 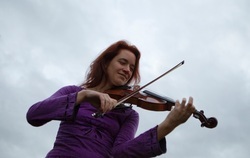 Laura's favorite fiddleplayers are Laurie Lewis, Stuart Duncan, Clayton Campbell and Joost van Es. Bert Hilberts was born in Coevorden and lives in Schoonebeek since 7 years. He was raised listening to the music of Jim Reeves, Buck Owens and Chet Atkins. Inspired by the music of The Alabama Country Boys he started playing the guitar in 2002. Five years later he started playing the double bass. He played the double bass in The Alabama Country Boys for a short period of time. He also plays the double bass in Touch of Grass. Favorite bands include lll Tyme Out, Dailey and Vincent and Balsam Range. 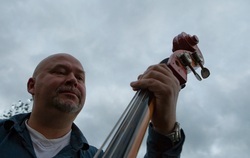 Hans was born in Drachten and lives in the city of Groningen since 1989. He began his musical career as drummer of the famous Frisian punkband Stalin Orgels. After playing in many bands he eventually discovered bluegrass music. In The Hillbilly Holler he finally exchanged his drums for the mandolin. In 2009 Hans was diagnosed with Multiple Scleroses, playing in a bluegrassband like Stringtime was one of his main goals in 2010! 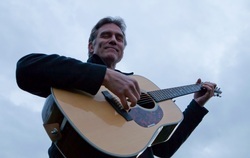 Jan Pals is one of the best bluegrass musicians in the Netherlands. Recently he has been playing mainly the mandolin (in Lazy Tater), but he is an experienced banjoplayer as well. We're very pleased to have him on board as our banjoplayer and mandolinplayer. 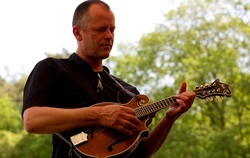 Nowadays Jan also plays the mandolin as one of the guest musicians during Babes in the Grass concerts.